Thank you for joining the Purple Campaign’s coalition to end workplace sexual harassment. Learn how you can get involved in the movement today. Courageous women have broken the silence by sharing their experiences with sexual harassment in the workplace, exposing a systemic problem that exists across every industry. Now we must work together to create lasting change. The Purple Campaign’s mission is to end workplace sexual harassment by implementing stronger corporate policies, establishing better laws and empowering people to create lasting change within their own workplaces and communities. It won’t be easy. But we believe that by working together, we can implement long-term solutions to achieve lasting reform. INTERESTED IN BECOMING A CORPORATE PARTNER? Learn more here. 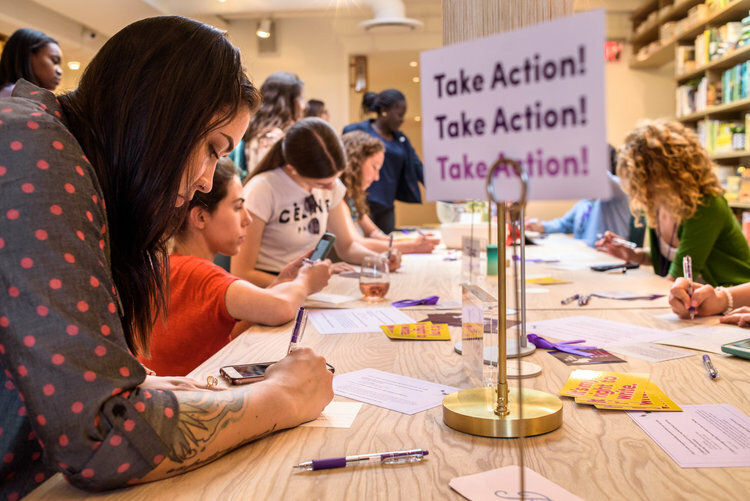 Purple Campaign President Ally Coll sits down with Roll Call to discuss how the Purple Campaign is working to end workplace sexual harassment through action, education and elections. We kicked off our latest action campaign at our June event — "#MeToo: Movement on the Hill" — at The Wing in D.C., featuring Congresswoman Cheri Bustos and Congresswoman Jackie Speier. Prior to the start of the panel, we asked people to write their elected officials that #MeToo must remain a priority on Congress's legislative agenda. We continued the call to action by providing people everywhere with five-step instructions on how they can contact their members of Congress from home. If you haven't already, join us by writing your elected officials today. In September, the Purple Campaign and Harvard Law School Executive Education hosted industry leaders and legal and policy experts from more than 30 companies and 20 legal and policy organizations for a #MeToo, Now What? sexual harassment policy workshop at Harvard Law School. Over the course of two days, participants attended a series of interactive sessions aimed at preventing and responding to workplace sexual harassment, and rebuilding and reimagining the workplace of the future. Click on the button below to learn more about the #MeToo, Now What? workshop. Sign up to learn how to get involved in the fight to end workplace sexual harassment. Thank you for joining the Purple Campaign’s coalition to end workplace sexual harassment! Learn how you can get involved in the movement today. The Purple Campaign - Why Purple?